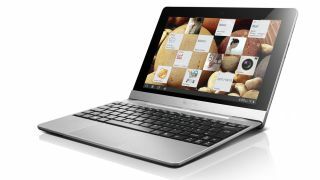 The three latest tablets from Lenovo have been revealed at IFA 2012, with something to suit everyone. First up we have the Lenovo Ideatab S2110A – no flashy hyperbolic names for Lenovo, just a random assortment of letters and numbers and some nonsense portmanteau. This one's meant for entertainment – enter the 10-inch screen, micro-HDMI port for full HD out and the wholly unnecessary 5MP camera with LED flash. But all play and no work is presumably not something Lenovo endorses given that the Ideatab S2110A also has a detachable keyboard dock which doubles the battery life of the tablet to up to 20 hours. Also on Lenovo's game card are the Ideatab A2107A and A2109A, both at the affordable end of the spectrum (although prices for all the tablets are yet to be revealed). They both measure 7-inches and the A2109A has a quad-core Nvidia Tegra 3 processor to write home about. The A2107A, meanwhile, is meant for less power-hungry activities like reading, web browsing and email. All three tablets are running Android 4.0 (ICS) and heading UK-wards, with pricing and availability still under wraps. Over in the US, the A2109A and S2110A are available in the US now with prices starting at $299 and $399 respectively. The A2107A will be hitting the States 'later this year'.